Grant Thornton has completed some research (free FT link or Google “How much do you really pay your money manager?”) which concludes that someone entrusting £100,000 for 10 years to a UK financial adviser or investment manager would pay an average 2.56% annually for financial planning services and financial product expenses. Let’s look at what that might mean during both the wealth accumulation and drawdown (assuming no annuity is purchased) phases of a typical investor. When it comes to investment return, excluding expenses, I believe that active investing is a zero sum game resulting in average performance no better than that of the market average. Of course there will be some winners and some losers, particularly in the short term, but that’s for another day. Today let’s therefore assume that the investment return these money managers achieve is that of the market. Let’s look at a couple of possible portfolios. Unfortunately, the Vanguard LifeStrategy funds have only been around 5 years or so which isn’t enough time to use for this study as I need 10 years (or so) of data. 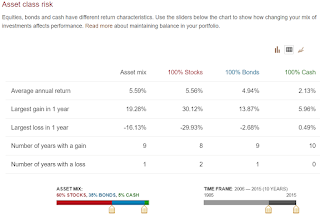 Vanguard does however have an interesting Asset class risk tool (h/t diy investor (uk))which allows you to input a period and an asset allocation. 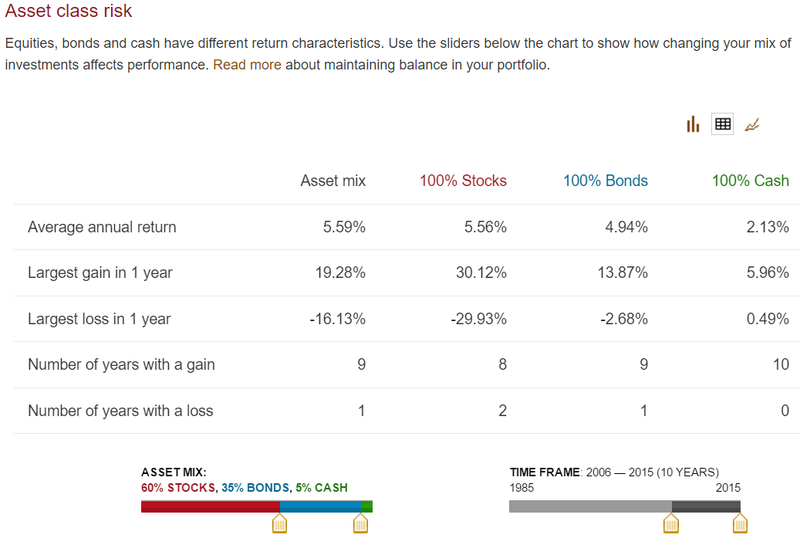 Let’s create a reasonably balanced portfolio with 60% stocks, 35% bonds and 5% cash and run for a period of 10 years. The result is an average annual investment return of 5.59%. So with this return what does our investor have left after a few subtractions. Firstly, let’s subtract the erosion caused by inflation. The RPI has averaged 2.87% over the last 10 years. Subtracting that gives us a real return of 2.72%. Now let our money manager and the investment products s/he is peddling take their cut of 2.56%. Oops our real return is now 0.16%. Looking at it another way our average money manager/investment product provider is taking 94% of our real return, leaving us with 6% only, which is hardly conducive to long term wealth building. It also gets worse as that will be before portfolio turnover costs, taxes and trading costs to name but three. After those we’ve probably nearly done no better, or maybe even worse, than matching inflation which might mean we’re actually even going backwards. I do however hear readers gnashing their teeth and shouting that the portfolio chosen is not diversified enough because it includes no international equities, emerging market equities, property, commodities, corporate bonds... Let’s do that by now using my portfolio. I’ve only been at this game for 8.9 years and so only have data for that period. It is however long enough to have invested through a bust (the global financial crisis) and the subsequent boom. To date my investment return, after expenses and withholding taxes, has been 6.85%. Over the course of my journey expenses have probably averaged 0.4% (they were already down to 0.59% in November 2009 and were 0.25% last weekend). It’s a bit of a guesstimate but let’s add 0.1% for withholding taxes. Summing those gives an average annual investment return of 7.35%. As before let’s now remove inflation and money manager/investment product expenses leaving us with a real 1.90% investment return for ourselves. It’s a little better but in this scenario we’re still losing 57% of our real return to our money manager/expenses. So our average money manager and investment product provider is making it real tough to build wealth. Let’s now look at how much wealth we actually have to build if we want to keep his/her help through our retirement. Wade Pfau tells us that if history repeats with a 50% global stocks : 50% global bonds portfolio, with a 30 year investing horizon and inflation linking our spending, the maximum we can extract from our portfolio per annum is a starting 3.26% before investing expenses. Firstly, let’s look at my DIY approach and assume a desired starting spend of £25,000. As mentioned above my investing expenses are currently running to 0.25%. So under our 30 years retirement scenario I would need wealth of £25,000 / (3.26%-0.25%) = £830,565. Now let’s get help from our average money manager and investment product provider. In this scenario I now need £25,000 / (3.26%-2.56%) = £3,571,429. That’s quite a difference. Stepping into the DIY investing world is not without risk. My experience suggests that you do need to educate yourself and even with that you will still make some mistakes. There is also of course the risk that you might lose it all. The question I’m asking myself though after thinking through the ramifications of the Grant Thornton study is can you afford not to DIY invest? I always find these comparisons quite interesting, and I know that I also am at odds with most of the FI community on this one. You are spot on that with the average returns generated, you are better off just throwing money into something like the Vanguard 80/20 than through a money manager. I do openly admit however that I do use a money manager - for multiple areas of investment, and also to help with tax planning. I monitor on a monthly basis both his performance (based on each area of investment) and my own personal stuff I play with - and to be fair he knows this. So far he is helping as I am suitably diversified (I wouldnt be based on just my own selections) and helps keep my tax down as much as legally possible. How is he doing? I only have about 5 years of data to go on, but I am beating him. That said, the returns are still above the market rate - the portfolios with him are chugging up at around 8 - 10% a year, after fees. I can live with that. My returns - I am biased as so far this year I am up 40% YTD - so my rolling 5 yrs is 15%, however I believe this is more luck than judgement on my part and I am reducing my exposure to more "high risk" (some would say gambling) side I know it wont be the same. In comparison to your money manager since the start of 2012 (not sure if that is similar to your "only have about 5 years of data to go on") my investment return after expenses and withholding taxes has been 8.1% so at the bottom end of you active managers 8-10%. Of course time periods could be wrong and we don't know how the risk profiles of the portfolios vary. Given active investing is a zero sum game the next question is can s/he keep the performance up for the next 40 years or so. 40% YTD - that is some active investing out performance. Congratulations, you must be grinning from ear to ear. Are you able to share where the lion's share of that came from? yes - its about an average performance, but as you say, can he keep it up - that is why I continue to monitor it and see how he does - as long as it remains then I dont mind. As you say it also depends on the risk profile - I am across EM, Developed, Bonds, Property etc. As you say 40 I am - although I have lost some over the last week! I've been really happy with it, but my usual challenge is when to sell out, and I may have missed it. Lions share came from 3 different AIM shares to be honest - I've held 2 of them for a while, and they finally came off - one is up about 15% from cost, one hit more than 3 fold but now only about 2 and a bit (and also pays dividends), and the third which is up more than 3 fold in 8 months. I can ping you the names if you are interested :) I do like to take the odd gamble but trying to build up some diversity and trackers for suitability! Thanks for coming back on the Q's London Rob. So your Financial Adviser has you across a diversified portfolio. If you were to break it down to a rough "Equity" (inc half property) and "Bond" (inc the other half property) split what are percentages? Just trying to get a feel for risk. In comparison I'm currently 56% Equity (inc gold, 1/2 property) and 44% Bonds (inc NS&I ILSC's, cash). If he has you anywhere near that then he should have been blowing me out of the water as I know bonds have been exceptional in recent times and I know I'm being weighed down by the 'secure' house purchase fund - the ILSC's and cash portion of Bonds - which is now getting on for a quarter of my asset allocation. AIM shares are a bit to 'interesting' and 'exciting' for me but thanks for the offer. As it stands now, I am split between UK, North American, Asia & Pacific, European and "Other" which equates to about 75%. about 20% is in fixed interest and cash, and the remainder is in "Alternative". I suppose I ought to also flag how I calculate the returns we both get as I dont think I do it the same way as most - I do a very simplistic, but fairly harsh, measurement (I think, but happy to have inputs!). Given my lower allocation to equities and your not holding large amounts of cash/ILSC's I would have expected more out performance than what you mention. Of course don't have all the detail so may have missed something... Do you know the annual expenses (money manager and product) you are actually paying? I laid out how I calculate returns in this post. All my records are in a single Excel sheet so it's pretty easy to calculate 'exactly' (it's a bit me also and everyone needs to do what's right for them which is why I don't share things like my Excel sheet and why what you do might be right for you). In short I use XIRR for annualised returns, correct that with a PRR calculation for partial years and then for multiple years calculate a CAGR. Your calculation method might be what's different rather than under performance though. If he's quoting 14% annually for 5 years then that's quite different to your 8-10%. In terms of charges, I pay 0.5% of money going in (i.e. 50p in every 100 GBP), no trading fees, and then depends on the funds depend on the charges, some under 1% some a bit higher for the more exotic. Nice. But.....you appear to be assuming you will live forever. The essence of deferred consumption is that it is deferred but still consumed. I am very conscious that I am mortal however I'm also conscious that I could have a lot of years left in me yet. As a healthy 43 year old UK life expectancy calculators have me living to an average age of 80.6 years. I am therefore planning around a long FIRE period. There are a few money managers worth it, usually not very known... And usually the don't want to manage too much money because they loose their edge. Comparing portfolio performance figures is fraught with difficulty , inconsistences and overrall - not really comparing like with like. for more than 2 years - it's value is discounted when calculating IHT payable on your ISA portfolio after death. Sorry - the appearance of the " table " of FTSE levels has not appeared as I wanted. But another important aspect is tax optimization. As of this year, married couple can earn 32K tax free ( 2 cap gain allowance + 2 dividend allowance) from their portfolio given smart allocation to max the allowances. If we take 4% withdrawal rate, then we need only 800k sum for this. This is the same as taxable income of 51K. If we withdraw 4% as taxable income, then we need a portfolio of 1200K. this is 50% higher portfolio required if we pay taxes! Dont forget its not just the dividend allowance, as this does taper depending on earnings, our tax system is fraught with loopholes to catch people out! I do pay for my advisor who also helps on the tax planning as under current rules I can find a way, once I stop working, to pay minimal tax legally. And before blasting me - I have already paid a huge amount of tax in my career, and put way more into the tax coffers than I take out! Up front advice fee - 3.5% (of either your lump sum or forecast regular contributions over 4 years. £12,167 over the next ten years. It's not quite as simple as that IMO. I'd agree with the premise of your title in the wealth building phase. But as you get older, some things change. I pointed my nearly 80 year old mother at an IFA. I could teach her a little bit about the high-level issues, but she is in poor health, I have a risk profile which is definitely not in the widows and orphans category, and the aim for her money is basically seeing her right as far as she can use her money to make her feel better. That is getting the right sort of living support/care. The sort of insurances and tradeoffs available for care support are products of which I have no knowledge at all. Let's face it, when you're 80 and not in great health your investment horizon is probably 10 years absolute tops. If she pays (on a annual up front fee basis) 20% over that period but she gets security of care for that it's not so bad. Annual fees add up for you if you have a 40 year investment horizon. But in very old age/ill health, there are specialised products that address some of the specific concerns. I know all the pack drill about financial advisers, and screened towards those that favoured low-cost index funds for the equity exposure. I looked for a IFA that was a member of the society for later life advisers specifically because her situation involved risk calls I have no understanding of - health and care costs, as well as to specifically avoid any conflict of interest/risk profile issues since I would be a beneficiary of anything left over. In my view it's her money and she should use it to benefit her quality of life and if that means she departs this earth just as her pockets empty that's all to the good IMO.